RANGOON — Despite several bomb attacks, some fatal, across Burma over the past week, the Buddhist light festival, called Thadingyut locally, is drawing thousands each evening to a busy downtown Rangoon intersection, where food and fairground attractions are taking people’s minds off recent explosions that killed three people and injured several more. Thadingyut marks the end of Buddhist lent and, for monks, the festivities mean the end of a three-month Lenten retreat during which the contemplatives are to stay inside their monasteries. Tiloka, a 67-year-old monk who goes by a Pali name, ambled through the crowd while trying to make himself heard above the hip-hop blasting through speakers around street-hawkers selling fried crickets and burnt-black corn. The old man wasn’t unnerved by the recent bombs, which he said were too random to count as a valid reason for people to steer clear of the street party or for officials to cancel the festivities. By Friday morning, four people were reportedly being held by police in relation to the recent attacks, which officials have speculated were an attempt to undermine Burma’s upcoming hosting of the Southeast Asia Games and the country’s chairmanship next year of the Association of Southeast Asian Nations (Asean). Whatever the motive for the attacks, festivalgoers were not too concerned that these packed Rangoon streets would be targeted. Tukun Nath, a doctor who returned to Burma two years ago after four decades practicing abroad, felt sure he was safe to stroll around and sample the fried snacks and glutinous-looking desserts shining under vending cart lights. Festivals have been attacked in the past, however, notably in three explosions that killed at least 10 people during the 2010 Thingyan or Buddhist New Year festival. 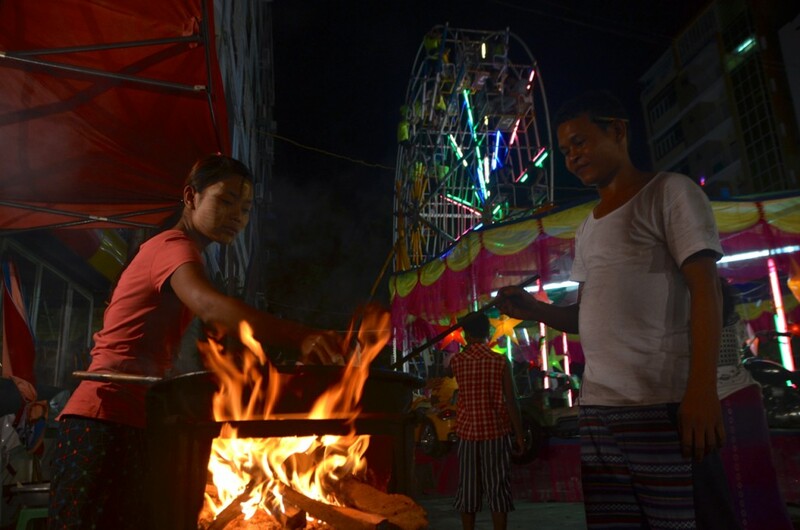 The festival area is a 10-minute walk from Rangoon’s well-known Traders Hotel, site of a small explosion on Monday night that wounded an American tourist, news that has sparked concerns that Burma’s budding tourism sector could be affected. At a Tuesday press conference, Burma’s director general of the Ministry of Hotels and Tourism, Aung Zaw Win, said the government was encouraging hotels to bolster their security measures. Half-visible behind a Ferris wheel, the MK Hotel is right in the middle of the carnival. Hotel management is worried—not so much about a security threat, but by the prospect of lost bookings. Joseph Saw Min Thein, a receptionist and assistant manager, said the hotel has hired additional security in recent days. “There is a police station across the street, and every day they check here and keep watch,” he told The Irrawaddy. But business has taken a hit. “Last night a tourist from Germany sent us an e-mail saying she doesn’t want to come now because of the bombing,” he conceded, adding that the hotel sought to reassure the reluctant traveler by suggesting that extra security was in place. Back outside on the nearby streets, children wait in line, watched by parents, to jump on merry-go-rounds or get strapped into their seats on the Ferris wheel beside the hotel. For some younger festivalgoers, this year marks a first chance to sample a Thadingyut street festival. Zin Noble, 21, and Phyu Mar, 23, were among the carnival novices. Asked if they were concerned by the recent bombings or were inclined to give the event a miss, they shook their heads.